I am not sure how I feel about Autumn. To be honest, I always think that I like it, but when it comes around, I remember what a pain in the back side it can be. One minute you are wrapping up in your winter coat, ready to face the elements, the next, you are sweating your victory rolls off and wondering who turned the heat up all of a sudden! Getting your outfit right in Autumn is like trying to teach a dog Spanish - impossible! And today was no exception! The Husband and I rushed out of the house at 9:30 to ensure that we got our latest blog shoot completed before either a) the heavens opened) or b) we had an unexpected tropical heatwave! Rucksack and outfit changes at the ready, we headed out to Fritton Woods, where I reviewed my recent haul from Chic Style Boutique. The first outfit of the day was the Mara Checked Shirt Dress by Collectif. What can I say about this dress other than (*insert Janice from Friends voice) "Oh My God"! I love it. The colour pallet of red and black is my jam; I cannot get enough of this colour combination. Everything about this dress is absolutely perfect - the colour, the fit, the style. There is nothing that I don't like about it. Dresses like this are the reason why you pay more for Collectif; they are just downright perfection and made to a superb quality. The dress features a detachable belt, which I really like. There is nothing worse than a belt you cannot remove or adjust, especially if you have a smaller or larger waist than average. The length of this dress (as always #hobbit) is a little longer on me, but you lofty loves will have no issues with the standard length of this skirt, which comes in at 20 inches (45 inches over all length as advertised). As for the other measurements, this dress comes in absolutely true to size. The bust comes in at 34-36 inches (as advertised) and the waist is 26 inches, which is again, spot on with the size chart. The hips are free as you can see. As described, there is limited/zero stretch with this dress, so if you like outfits that have a bit of wiggle room, please do consider sizing up. However, as it stands, the Size 8 fits me perfectly. Well done Collectif, well done! This dress is just the perfect work outfit, casual outfit and could even be worn out to dinner (which I intend on doing tonight!). I just love it. 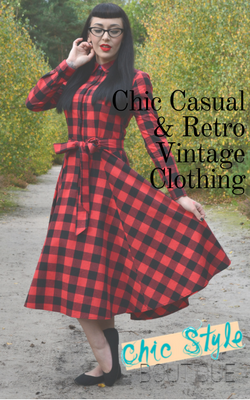 It's comfortable, perfect for Autumn, when, lets face it, no one knows what the weather man will bring, and it just oozes Rockabilly chic. I'm surprised I haven't worn it to bed yet. Have I mentioned how much I love it? No? Well, I do! Oh and I forgot to mention...it has POCKETS. Yah! It just got even better!! Next on the agenda is the Jasmine Evergreen Check Swing Skirt. The emerald green tones in this skirt have a real Christmassy vibe. Fastened with a side zip, this skirt is perfect for Autumnal layering. I have teamed it with a classic black Dolores top from Collectif, but you could easily bring mustard, red or white pallets into the mix. Size wise, this Size 8 skirt fit me like a dream. I really hate it when swing skirts are too tight around the waist, so I was delighted when this one arrived with a little wiggle room. The waist on this is 26 inches exactly, as per the size chart, so this is very much true to size. There really is nothing else to say about this skirt, other than it is, for me, an autumn wardrobe staple. 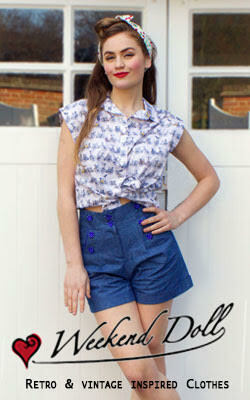 The fit is perfect and it is of the quality that I have come to expect of Collectif. The skirt is not massively full, as it is a more loose hanging fabric, so if you would like a fuller look, you will definitely require a petticoat with this one. However, as it is quite a casual piece, I would opt to wear it without one, unless you are dressing it up. Last, but by no means least, is the Talis Rose Embroidery Swing Skirt. For a relatively simple design, this skirt certainly packs a punch. It is, what I would consider a 'naturally full' skirt - it sits fully, without the need for a petticoat, which I am all for! The skirt features 3 beautifully embroidered rose motifs on the front and back and, wait for it...IT HAS POCKETS!!! Fit wise, I would say that the measurements for this skirt are a little bit larger than described. I am wearing a Size 8, which is listed at 26 inches. The skirt does however measure 27 inches. I really don't mind this however, as it means that tops and jumpers can be tucked into the skirt and gives a little bit of breathing space / more room for cake. If you would like any further information or advice on any of the above outfits, please feel free to drop me a message on Blogger or Instagram and I would be happy to help! Chic casual outfits looks so charming. All the skirts are just awesome. The red rose motif are excellent. All the pictures uploaded on this blog are amazing. Waiting to try one of this and share with my friends but only when I complete my we write your essay. Thank you for the post.